As our Melody Charles beautifully described in her new review, "Like other meaningful artists who came before her, N’Dambi is felt before she is heard. Gifted with a raw, resonant contralto and a presence that’s both sultry and self-possessed, the Dallas, Texas native is a performer who can reflect a given mood as well as she can create one. Although early in her career she was a background singer for her more flamboyant peer, Erykah Badu, N’Dambi was always carving her own niche as a purveyor of home-grown, funk-fringed, yet eclectic soul." N'Dambi won us all over again with each album throughout her incredible career. But it has been nine (!) years since her stunning, Leon Sylvers-produced album, Pink Elephant, and we've been waiting and waiting for more. Well, now she is back with a new album that is all that. Air Castle is a once-in-a-lifetime collaboration of two ambitious musical forces: N'Dambi and All Cows Eat Grass frontman T Brown. It's a cosmic outing, pairing the organic warmth of N'Dambi's honeyed vocals and sophisticated songwriting with electronic synthesizer layers, 80's sonic cues and retro-future compositions that in the end defy easy categorization. “This project is an experience....a trip. Depending on where you come from determines how you hear it" declares N'Dambi. T. Brown characterizes it as an "Innocent exploration through different styles and concepts aiming to please and intrigue," ultimately taking you back to your future. We simply call it a sonic joy that brings back an artist whom we've missed, and who is glad to be back. N'Dambi tells us, "Thanks to the SoulTracks family for allowing us to share this new musical offering with you. This project is an adventure to another place deep inside of your dreams, left to your own interpretations. We hope you enjoy the ride." 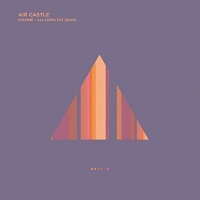 We are excited to present Air Castle as our newest SoulTracks Featured Album. Check out this powerful EP, and welcome back N'Dambi!